I am sitting in Bangkok now, at a small round table. 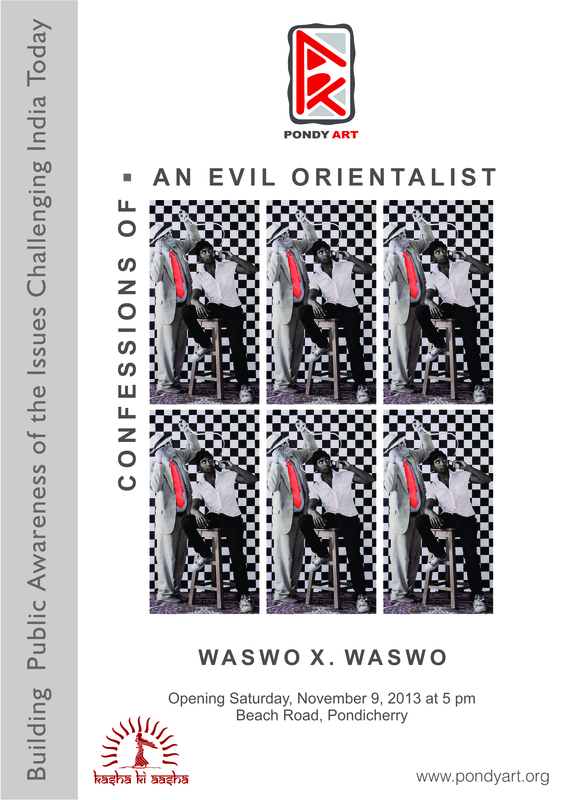 It is the same table at which, just one year ago, I first began to make the list that became The Confessions…a text-based art piece central to the exhibition Confessions of an Evil Orientalist. In that exhibition the list of confessions appeared three times: as a slow-moving video text that was part of the larger installation titled Mantra in a Palki on a Pedestal, as the culmination of a story in a free take-away comic book, and as the main feature in a framed collage titled The Confessions, where the full confessions were typed on antique legal papers and embellished with, among other things, small paintings by R. Vijay. As the three presentations suggest, the confessions can be read in various ways. They can suggest sincere reflections on my part. They can play into a farcical story of misadventure. They can suggest coerced admissions by the cultural police. They can become a poem with many layers. Unfortunately, much of the printed discourse surrounding the show failed to grasp the fact that these three works, all derived from the same text, actually raise more questions than they answer. The confessions are not just self-critical admissions by me, the artist, (as has been presumed by some in the media). The confessions also beg for self-reflection on the part of the viewer. They beg for reflection in larger cultural contexts. Displaying The Confessions with hanging copper “Oriental” magnifying glasses caused viewers to pick up the lens and transform themselves into the examiners. A mirror in another small installation (hidden in a corner) made them look at themselves. Waswo X. Waswo was born in Milwaukee, Wisconsin, in the U.S.A. He studied at the University of Wisconsin-Milwaukee, The Milwaukee Center for Photography, and Studio Marangoni, The Centre for Contemporary Photography in Florence, Italy. His books, India Poems: The Photographs, published by Gallerie Publishers in 2006, and Men of Rajasthan, published by Serindia Contemporary in 2011, have been available worldwide. The artist has lived and travelled in India for over thirteen years and he has made his home in Udaipur, Rajasthan, for the past eight. There he collaborates with a variety of local artists including the photo hand-colourist Rajesh Soni. He has also produced a series of autobiographical miniature paintings in collaboration with the artist R. Vijay. Waswo is represented in India by Gallerie Espace, New Delhi and Sakshi Gallery, Mumbai, and in Thailand by Serindia Gallery, Bangkok and also by Indigo Blue Art, Singapore. In Europe the artist is represented by JanKossen Fine Art, Basel. Rajesh Soni was born on the 6th of August, 1981. He is an artist living in Udaipur, Rajasthan, who has become known primarily for his abilities to hand paint digital photographs. He is the son of artist Lalit Soni, and the grandson of Prabhu Lal Soni (Verma), who was once court photographer to the Maharana Bhopal Singh of Mewar. Prabhu Lal was not only a court photographer, but also a hand-colourist who painted the black and white photographs that he produced. His skills of hand-colouring photographs were passed down to Rajesh through the intermediary of his father Lalit. R. Vijay, son of Mohan Lal Vijayvargiya, was born on the 22nd of March, 1970, and is a grandnephew of the historic Rajasthani painter Ramgopal Vijayvargiya. The artist received little formal training and his miniature painting style has been described as naïve, though his works have drawn attention and praise from various critics throughout India. Early in life R. Vijay was tutored by traditional miniaturists such as Sukhdev Singh Sisodiya and Laxmi Narayan Sikaligar. Later he developed his own style, which has been called an eclectic mix of Persian and Mogul styles, along with a bit of the Company School of Indo-British art.